Occidental food, at the highest temples of cuisine defined and dictated by the Michelin Guide and the World's 50 Best Restaurants list has undergone a transformation. Most exalted restaurants used to tend toward the grand, the abundant, and the majestic, endowed with a clearly defined center, surrounded by delicious sauces. The avant-garde cooking, which is the trend nowadays, privileges the theatrical element, the show, colorful bites meant to be photographed and Instagrammed, and form over substance. It is now the chefs that are quitting the backstage of the kitchen in favor of the limelight of the dining room and social media. Traditional grand chefs used to call themselves artisans who labored to perfect a dish before they put it on the menu. New style chefs call themselves artists who “create” new dishes on a daily basis and when somebody dares to be critical the typical defense is to claim that “they did not get the concept behind the dish”. All is fine except one thing. The great seafood restaurants are disappearing from our world, along with the gradual extinction of fish and shellfish species, like the extinction of opera. We now make a virtue of necessity. The increasing prominence of avant-garde restaurants and highly manipulated food plated in specific forms to evoke the sea and the forest, with the help of original but impractical plates designed specifically for certain dishes, is a rational response to the increasing costs and rarity of great ingredients. A corollary of this is the use of social media by the chefs and the so-called “influencers” (see our article titled "The Society of the Illusionists: The World's 50 Best Restaurants") to emphasize the “naturalness” of the food when it is gradually becoming “denatured”. Molecular gastronomy now has a “pejorative” denotation; it is a better strategy to show the left, but hit with the right hand (just visit an international food symposium such as Gastronomica in San Sebastian and you will see the discrepancy between the discourse and the practice of using chemicals in a myriad of forms). Güeyu Mar is in Asturias, Playa de Vega. Elkano is in the Spanish Basque region, in Getaria (the most expensive real estate in Spain). It is probable that neither Abel of Güeyu Mar, nor Aitor of Elkano perceive themselves as great chefs. Probably they consider themselves as having mastered “a la parilla” (grilling) techniques. The amazing quality of the line caught fish, the cleanliness and cold temperature of the sea in Northern Spain, the alimentation of the fish with natural and varied small fish and shellfish, the depth of the sea and strong currents when the fish is caught, the excellence of the secret seasoning techniques that imparts the right and subtle acidity (called “Acqua De Lourdes” in Elkano), and the grilling techniques honed through tradition and experimentation, all amount to the same thing. 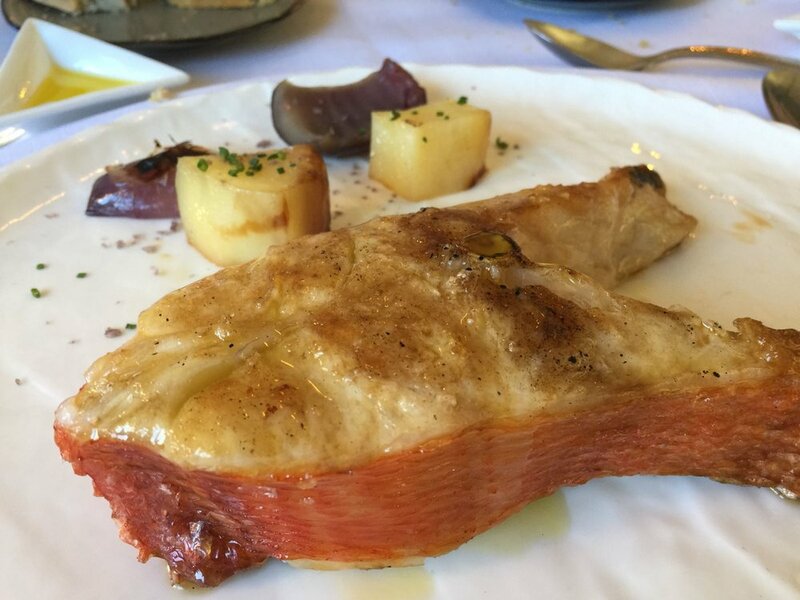 There is no way you can find this level fish in any Michelin three star restaurant or in any of the so-called top 20 restaurants of the world (with the possible exception of Asador Etxebarri). But I am not only discussing the fish. I am talking about seafood. Elkano is a totally locovore restaurant which uses seafood caught in or very near the rocky Getaria. Güeyu Mar is locovore for the most part. When I dine in these two restaurants, I cannot help but think of Roland Barthes’ remarks on a Japanese seafood with dashi in his Empire of Signs “…of an elixir all the more comforting in that it is pure: something aquatic (rather than aqueous), something delicately marine suggests a spring, a profound vitality”. Abel creates very complex and balanced flavors from seemingly simple dishes. His canned sardines and navajas (razor clams), especially the latter, possess a depth that I do not know how to describe, except by using the cliché word “umami”. Try the navajas with a glass of Oloroso and the sardines with a manzanilla. Fat anchovies from Cantabria with pepper escabeche are also top (he does not cure anchovies), and a glass of Vouette et Sorbee, Fidele, is not a bad accompaniment. His salpicón of lobster is a top example, on par with Ibai. His sweet and firm quisquillas (camarones) made me dizzy with pleasure, even more than the traditionally cooked angulas (baby eels) with caviar which were alive before cooking and extinguished with coffee infused water. The baby scallops or zamburinas are wild. Besides Güeyu Mar, I have only seen the wild ones at Asador Etxebarri, but Abel’s handling of them with local algae and black garlic is superior to Victor’s version with bean jus at Asador Etxebarri. You may try Kenjuro Kagami’s Les Sugettes from Jura (lean, precise, and chalky minerality with citrus), or an equally precise wine with a different sort of minerality, and less acidity, from the volcanic Canary islands, such as Benje from Envinate. The way Abel portions and grills the fish is an art form. Try whatever he recommends. Since we had two meals we had both the gelatinous turbot and the meaty merou with pedrones peppers. His rey fish (served with amazing potatoes and onions), in winter, is like grade eight wagyu, but more interesting, off of charts. Perhaps one should have it with red wine. Do not underestimate the local Urogallo (2012 El Carrascakl No 7, La Zorrina). Also, a wine from Cascais near Lisbon in Portugal was a revelation: 2001 Arenea Colares from the Ramisco sepage. It had a complex nose, silky texture, sweet red fruit, still bright acidity, and melted tannins, that all fit together in a very elegant framework (12% alcohol) and invites one to ponder, instead of taking detailed notes. Do not miss the “arroz con leche” at Güeyu Mar. What can I say about Elkano? I had previously reviewed it, and it continues to amaze me. It is the very opposite of the “wow” avant-garde style restaurant, where one can be impressed in the first visit, but see the gimmicks in the second visit. There is nothing gimmicky at Elkano. Here is the summary of the last visit. We started with wild red tuna belly with barely perceptible guindilla peppers and diced acidulated tomatoes: a top dish. Then we had the best quality percebes, followed by the contrast between “a la parilla” and “pil pil” kokotxas from Merluza. Only at Ibai can one find this level of freshness and precision. This dish may rank at the top of the most fulfilling, decadent, without being heavy (“pil pil”), pristine (“a la parilla”) seafood appetizers of the world. Texture-wise this dish is in line with what Ferran Adria and his derivatives are trying to achieve (soft, creamy, explosive), but this is totally natural. Then we were served camarones at their firmest, like the ones at Güeyu Mar, which was followed with incredibly sweet, juicy, and flaky necoras crab. Then we had creamy and rich red mullet (rouget, salmonetes) liver. Finally, we finished with the incomparable turbot, which is as complex as a “tete de veau”, as it is composed of different parts with differing textures and intensities of taste. Michelin starred restaurarants mostly discard the best parts of the turbot, such as the gelatinous meat attached to the bone and the head. Watching Aitor prepare a natural pil pil from the turbot at your table is akin to a spiritual experience. One smells, touches (chews the turbot bones), and savors something that is seemingly simplistic, but very nuanced and sophisticated. As Besim Hatinoglu writes in his next article on Joshua Skenes, “sophistication in simplicity is the hardest craft”. One then questions the gustatory value of over-embellished dishes composed of far too many ingredients in the so-called leading restaurants. The wine list is impressive and very fairly priced at Elkano. Talk to Niko, an excellent sommelier, for help with your selections. And do not miss the cheese ice cream with red fruit coulis. The fresh tangy cheese they use is better than Asador Etxebarri’s version with beet coulis. Overall one can say that both restaurants are naturalistic par excellence, without being self-consciously so. They have mastered the cooking with fire on embers in a myriad of ways reminiscent, but different than an early Victor at Asador Etxebarri before his international fame. The precision and technical perfection (low heat cooking) is geared to capture the essence of the ingredient(s), while enhancing and concentrating their flavors through a combination of knowledge, intuition, seasoning sauces and an X factor that may be called “coup de main”. These restaurants are not too bad (!) in the age of commodified dining as a theater and globe-trotting TV chefs. El Celler de Can Roca: End of History?